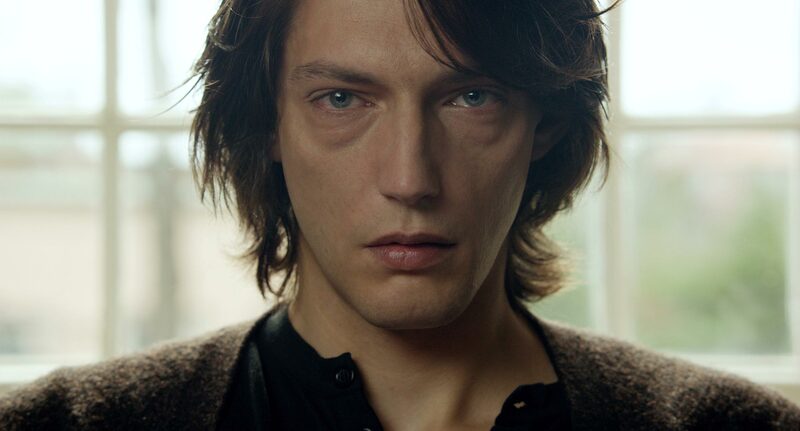 In Cosmos, the final film from director Andrzej Zulawski, failing law student Witold (Jonathan Genet) takes a vacation in a renter’s home. Disillusioned, he abandons his studies to pursue writing a novel that mirrors his time at the house. But his time in the house proves to be psychologically taxing. Strange visual motifs dominate the film. Bugs crawl over food, hanged animals appear intermittently, one character is consistently injured, another freezes mid-sentence at the dinner table. It all seems uselessly absurd, and that appears to be the point. The film is an existential breakdown in motion. Characters often run through a series of emotions in a single scene. Impromptu monologues burst out of nowhere. Characters act irrationally throughout. What results is a complex stacking of allusions, imagery, and anachronistic dialogue that is more meta-textual than it is diegetic. One could easily dismiss the film as intentionally dense with little payoff, but Cosmos is more about nothing than anything else. The male head of the household, Leon (Jean-Francois Balmer), uses the running mantra of “Bleurgh” to excuse the unexplained nature of existence. Witold (whose name derives from the author of the novel this film is adapted from) makes note that his time at the house feels as if it is already a novel. Sartre is consistently mentioned, as if he has some spiritual presence in the film. Thematically, the film is nothing more than a visual representation of the pure nothingness of living, yet Zulawski begs the audience to dig for more, just as we dig in life for something more. Tonally, the film is fascinating. Images of suicide juxtaposed with sexual tension brewing between seemingly every character create an eerie tension that feels surreal and hyperbolic. Zulawski weaves an absolutely poetic script that doesn’t let up on its feverish intensity or absurdist humor. Even after any one of the film’s various implosions there is no diffusion of this biting tone. This makes for a purely engaging experience. Perhaps Cosmos is overwrought with high-brow pedantry, where the meta meditation drowns the film in a melodramatic aura that can be off-putting. It is not a very palatable film, this is true. But Zulawski crafts something beautiful in the meaninglessness that is spellbinding. Given its distinct visual aesthetic, it is hard to look away for even a moment. For the cerebral-minded moviegoer out there, Cosmos is the perfect choice.